If it ain’t broke, don’t fix it, right? We disagree. There are always ways to update a home to suit your changing style and needs. Today we will take a look at a classic London home that got a glassy extension built on the back. This new space in the home is modern and angular and helps this traditional home take a step towards the future. 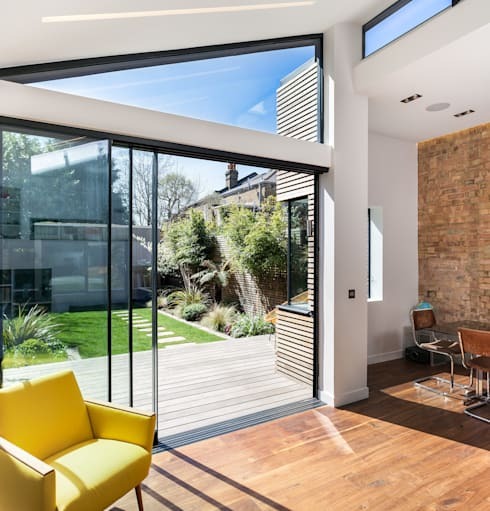 Let’s take a look at what makes this home extension so spectacular. 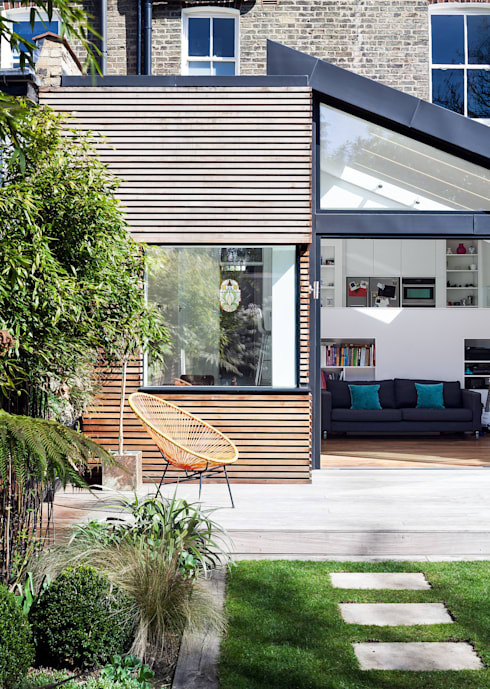 Architects built this extension cleverly and opened the home to the verdant backyard. New deck space outside creates a gradient in the home. Now there's a flow from the outside, to the new extension, and to the inner sanctuary of the original house. This new deck could also be used as entertaining space. The glazing on the top floor of the house matches nicely with the glazing of the extension. It ties the look together, closing the gap between modern and traditional. This sunny deck is a great place for relaxing on sunny afternoons! There is privacy from neighbours because of the high fence. We love the medley of wood from the deck, house, and fence. The modern orange chairs bring pops of citrus orange to the outdoors. The glazing is incredible here, with a window corner in front of the dining area. This wrap-around style of window really helps to open the home and bring in lots of light! In the backyard, the green garden and wood house make a beautiful combination. The overall look is upscale. The deck space is full of potential and could hold a grill, planter gardens, or a bench. Guests could be invited to enjoy the garden if there was more seating outside. 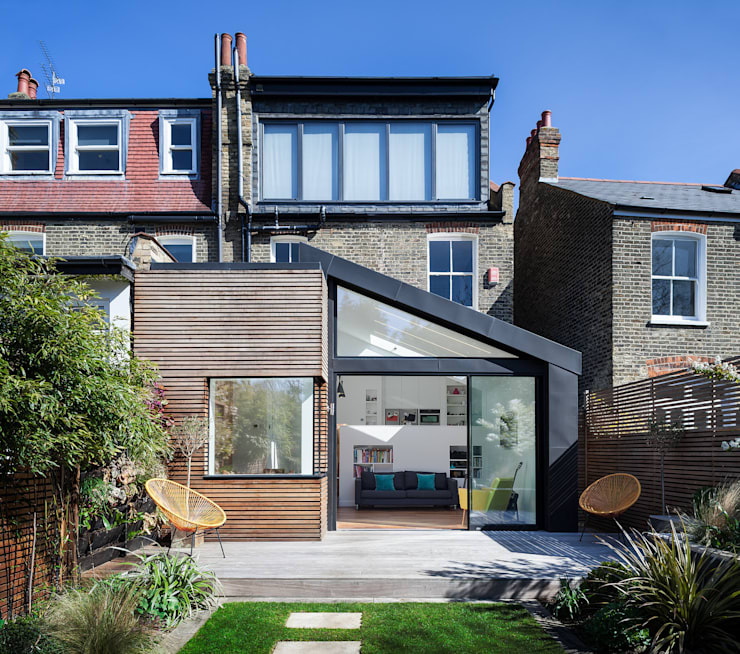 Looking at the home extension we are stunned by the use of glass and black angular lines. A view from the inside out is bright and clear. The extension has created a multidimensional space that’s anything but boring! Plain white walls couple with clear glass and black framing. 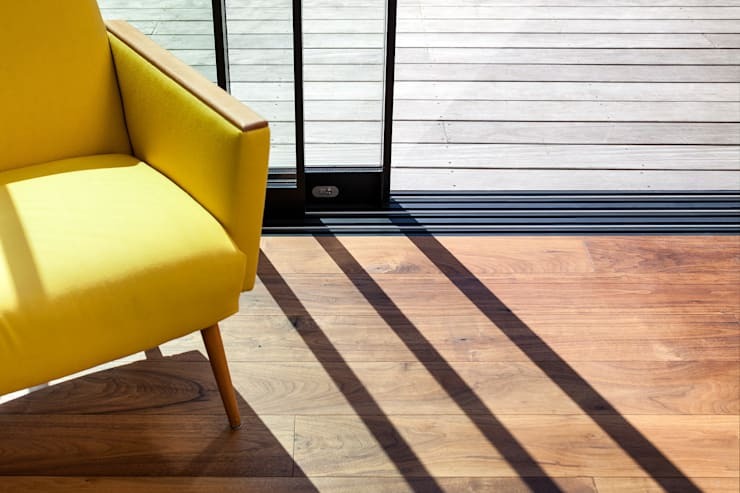 We love the mid-century style lemon yellow arm chair. A nearby guitar shows off the tastes and hobbies of the homeowners and brings more beautiful wood to the picture. Three panels of glass create a great frame for the yard out back. The wood of the house is echoed by the wood fence outside that frames the petite and charming garden. This view shows off the best of the glazing in the extension. A unique triangle window and some clerestory windows make the room bright and full of light. We love the exposed brick wall in the dining room. 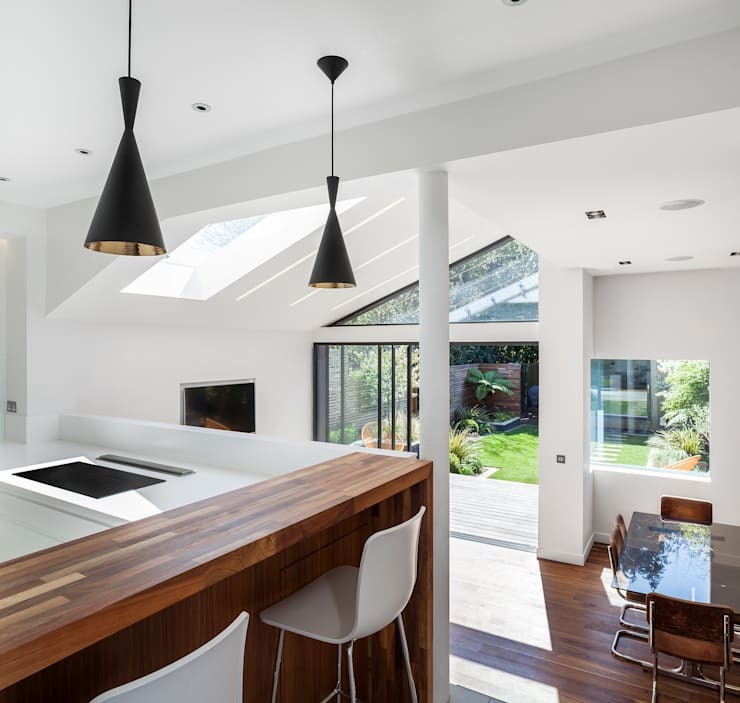 The extension has created a sense of dynamism in the home. When the doors are open, the space is fresh and modern with the high ceilings helping to capture the feeling of being out-of-doors. 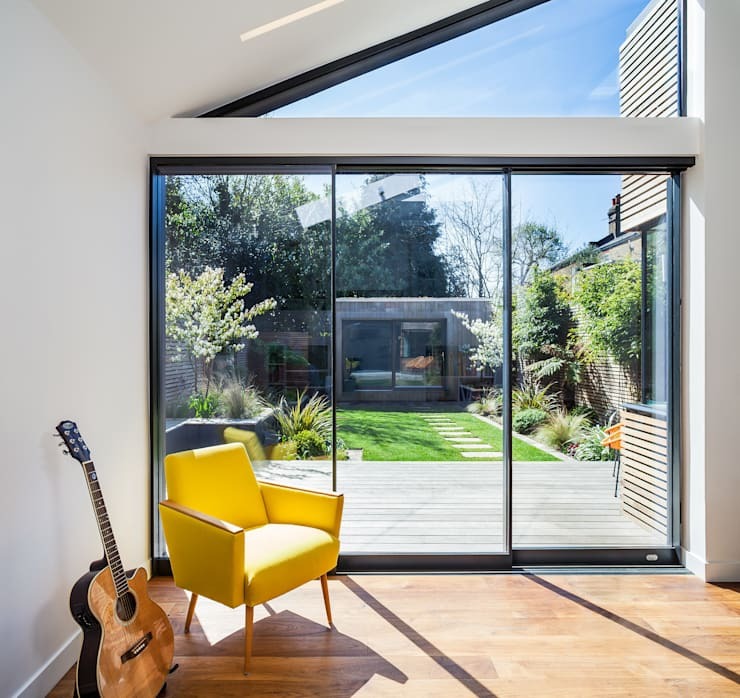 The extension floods the home with natural light. 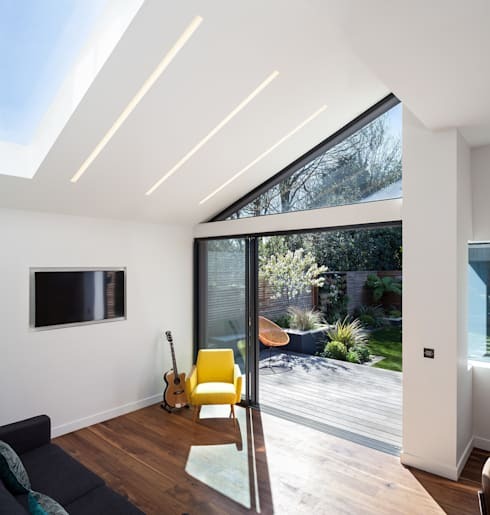 In cities that don’t see much sunshine, natural light is very important to bring into the home. It helps you feel awake in the morning and keeps you focused through the afternoon. Here we can see the detail of the track for the sliding doors. The wood floors of the interior and exterior shine. The striking difference in the wood stains means that it is cozy inside and bright outside. A wider look at the extension shows off the incredible sloped roof. The interiors were kept gleaming white to give it an airy and fresh appeal. The extension now houses a simple living room and dining room. We love the incredible skylight! 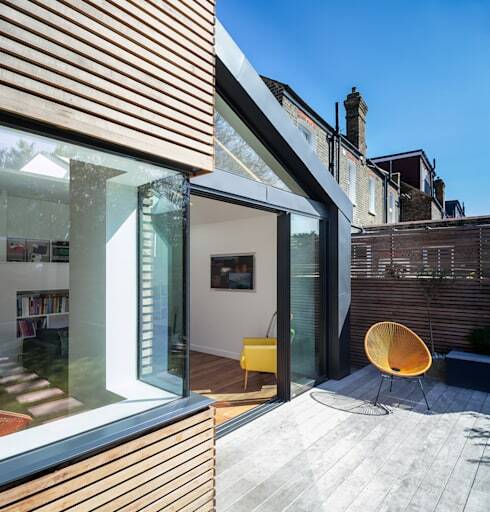 Just another incredible glazing feature of this extension. A last look at the extension shows how well the space flows down from the kitchen. This open split level design creates one seamless bright open space. A supporting column by the kitchen is slim and utilitarian. The graceful lines and shapes of the new home extension update the traditional home for modern life. Thanks checking out our feature on this beautiful glass extension. For more home inspiration, check out our feature on a family home that belongs on a film set!